Plagiarism Free Service: 100% Authentic, FREE Plagiarism Report! PhDWorks.org is the writing service that actively uses plagiarism detection software. We have a reputation of a reliable company providing plagiarism-free academic papers of supreme quality. Today, when universities have zero tolerance and severe penalties for non-authentic papers, PhDWorks.org uses the newest technologies and the strictest discipline to insure the customers do not receive poor quality papers. Almost all universities use plagiarism software. The control over academic writing is getting more and more severe. The ones to suffer are not only the cheating students. Even those writing on their own are often marked by a plagiarism detector, and restoring academic reputation after university plagiarism accusations is not an easy task. Unfortunately, a lot of writing services do not make attempts in avoiding plagiarism. Most often they are just mediators between students and uncontrolled writers. Such writing services prefer to deny any responsibility. PhDWorks.org stands on the basis of responsibility. We fight against plagiarism. It took us a while to gain the priceless experience we have today: to detect plagiarism and eliminate it. 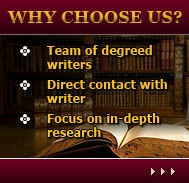 cooperation with experts in the field of plagiarism checking. Cooperation with profound plagiarism detectors provides us with the newest technologies in plagiarism checker system. Careful selection of writers with PhD or equivalent guarantees professionalism and an ethical approach to all the customers. A team of back-up office writers is always ready to do the manual editorial revision and double plagiarism control. All works are carefully scanned for plagiarism before being sent to the customers. Every customer receives a free plagiarism report enclosed with their order. We value our reputation. We believe in responsible quality custom writing. We are always open for your suggestions and feedback!